And once you're a part of the group then you have to figure out what kind of FE gifts you're going to give out to the people in your group. You don't want them to be too terribly expensive but the more unique the better. There are great items available on Etsy and Pinterest, so I would recommend checking there first. This is actually an item that you could make or buy and give as a FE itself. If you want to read more about the wave phones, you can check out this Youtube video. Once you realize how the Wave phone works you will realize how much you are going to want to have it on your being at all times, so rather than modifying your entire wardrobe to ensure appropriate holding places you can just take a wave phone holder and it will clip onto almost anything you carry with you including backpacks or even belt loops. There are some really cute ones out there. We got ours from PixieDustedStitches - she's amazing and her store has a bunch of awesome things. I chose Minnie and my husband is getting the pirate Mickey. I know we'll get our use out of these. Another thing I've learned about is door magnets, believe it or not. 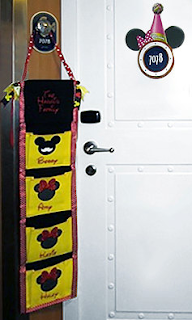 Apparently if you're really into the whole Disney cruise experience, you decorate your door. However, in order to not damage the doors, you are limited to magnetic decorations. 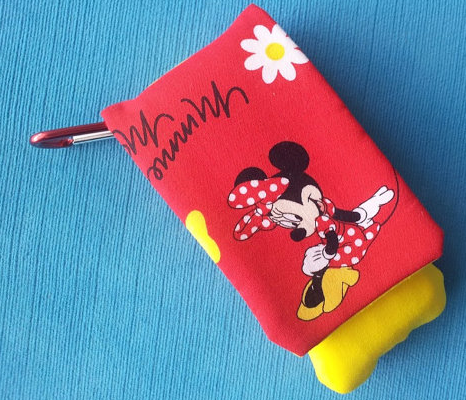 But - do not fear - once again, the crafty Mouse-lovers have us covered. You can turn almost anything into a magnet . . . or you can order some of the fun ones from Etsy. 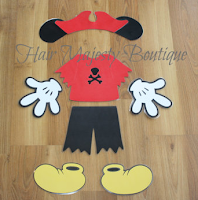 My personal favorite - due to the fact that I'm traveling with three boys - is the Pirate Mickey. My best friend has been planning this trip from the day we made reservations. She has all of our meals coordinated by theme with corresponding outfits. She made sure we knew what excursions we were going to do and made those reservations as soon as possible. She has a list of FE ideas and is slowly working her way through them in order to be ready well before the cruise date. While I would not have been compelled to do this much detailed planning without her, I have to admit it's been fun. AND it's really extended the enjoyment of the trip. We go shopping on average about once a week and so there's a continual excitement and anticipation. It's like the Christmas season lasting for 4 or 5 months! Now by the time October 5 rolls around, I think I will most definitely be ready for the actual event. But in the meantime we have thoroughly enjoyed learning, planning and shopping for this trip. But if you are going to make reservations for spa services, Palo (the adult only restaurant) or excursions through Disney you want to make them as soon as possible. We actually stayed up until midnight (EST) on the day that our reservations opened up, and got everything we wanted. But I know there were others on our same cruise who couldn't book the very same items even 48 hours after that. If you have any other tips for our trip, I'd love to hear them! I've never heard of a Fish Extender before, or even the idea behind it...but it looks like so much fun! What a great idea. We did the Disney Fantasy in April, and we LOVED it. We were looking at future cruises the next day. Love your tips. I never would have thought to bring/make something to put the wave phone in, I just carried it in my purse or pocket.